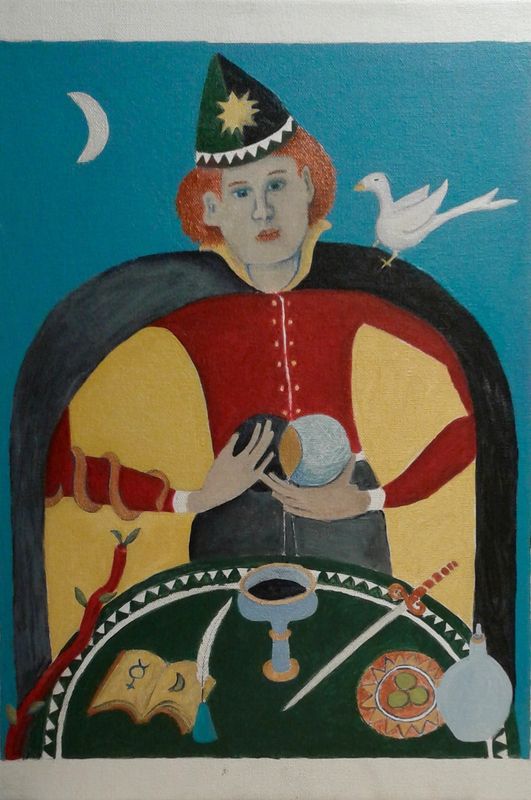 I think the Magician Card is finally done except for the border and maybe just a wee bit more shadow on the white globe he/she is holding and the snake wrapping around the arm. It definitely has taken me a while to get used to doing this genre. First of all it involves working upright rather than my usual horizontal plane for a painting. Second is figuring out what size to make the original image so it translates well into the size of a card. Third there is a whole history and tradition I have needed to become more aware of since the images are symbolic of the various archetypes traditionally expressed in Tarot–while also expressing my own vision I bring to the subject. It wasn’t enough for me to be somewhat versed in the Tarot, I needed to see more cards and study its history. I thus have been perusing several Tarot decks I now own–including that of my friend Christine and her husband Michael who inspired me to try my hand at this field to begin with. 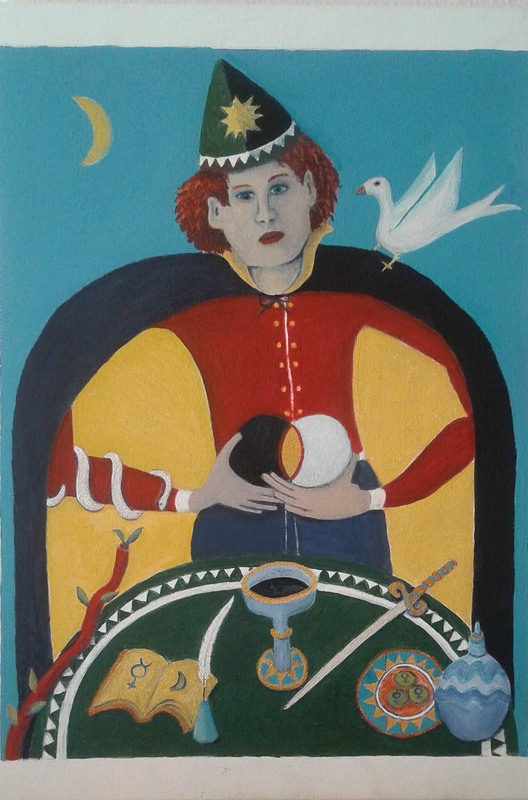 I am now starting to feel more comfortable with how it all works and look forward to making the next Tarot painting fairly soon. Christine says in a way its like playing 3-D chess, and I think she is right, especially from the point of view of making the images meditative pieces designed to take the viewer into a trance to more accurately divine what is or is not going on in one’s life.